Listen, I feel like I know Britney better than some of my friends. The world watched as the girl dubbed “The Princess of Pop” went from a preteen member of the Mickey Mouse Club to a billboard-topping bonafide star criticised for her ‘you’re too young to wear that’ attire. Eight years after her debut hit single “...Baby One More Time” travelled across countries, she had an intensely public breakdown brought about by “overwhelming anxiety”. An image of Britney with a shaved head has cemented itself in celebrity canon – make no mistake, at one point in time Britney was the biggest star on the planet. So when I was on a road trip and I heard there was an unofficial museum dedicated to Britney in her hometown, I knew I had to go. As I rolled into the tiny town an hour and a half north of New Orleans in Louisiana, I passed a sign: “Welcome to Kentwood: Established in 1893”. Below it, a pink oval with white letters says: "Home to Britney Spears." Britney was born in McComb, Mississippi, but she was raised in Kentwood. The moment we parked the RV, a guy called out: “I’ll trade ya for it!” He looked down at his rundown grey car, and then suggestively at our RV. Another woman shouted, “Are y’all looking for the Britney museum?” Visitors to Kentwood don’t go seem to go undetected. The woman gestured over to a building with a sign out front that said: ‘Kentwood Historical & Cultural Museum’. OK, not the ‘Britney Spears Museum’, but I walked over and knocked on the door anyway. A middle-aged woman opened up and started chatting about how exhausted she was, speaking in the thick southern twang anyone who’s heard Britney’s voice would be able to recognise. I slipped past the door and seemed to enter the late 90s. Pink, sparkles, and Britney covered the walls. Teenage Britney. Scandalous Britney. Las Vegas circuit Britney. Britney in stonewash jeans. Britney in wings. Britney in elaborate headdresses. In one corner, a huge set of white angel wings worn by Britney on her Femme Fatale tour is propped up on the wall. A sign above it indicates photos with the wings are $3 – the rest of the museum is by donation. Fay Gehringer, the woman who answered the door, says the building used to be a funeral home, but it was transformed into a museum in 1995. As Britney started to become famous, the town added exhibits dedicated to its brightest star. “We’ve had a football player that’s been in the Hall of Fame and basketball players that have done well, but Britney’s sustained a lot longer than anybody else,” she said. Gehringer sluggishly started the tour she’s been giving three days a week for the past nine years, but it didn’t take her long to cut into stride. We walked over to a wall with 14 U.K-edition Britney calendars. Gehringer explained that the calendars along with magazines and several books were sent by a terminally ill man from London. He wanted his cherished collectibles to be where they belonged when he died – in Britney’s hometown. “I always like to take fan contributions,” Gehringer says. In the next room, a glass case included Britney Barbie dolls, some of her old trophies, and a particularly striking jaguar headdress. I caught myself staring at a poster of Britney with the Mickey Mouse Club alongside future pop royalty: Justin Timberlake, Christina Aguilera, and Ryan Gosling. On the other side of the room, I looked Britney straight in the eye, or at least a life-sized cut-out of her with a ‘got milk?’ ’stache. “With her schedule Britney’s not back to Kentwood as often as she used to be,” Gehringer says, adding that if she does visit, it’s to see her parents at the family estate that they named ‘Serenity’. Britney visited the museum back when it opened, but she wasn’t exactly flattered. “Back then she was just in awe because she couldn’t believe anybody would want to come and see anything of hers or hear anything about her,” Gehringer says. “Since then, her mom and dad have talked to her and she’s proud of it. They send items here to let her fans have them and she’ll sign some things occasionally." 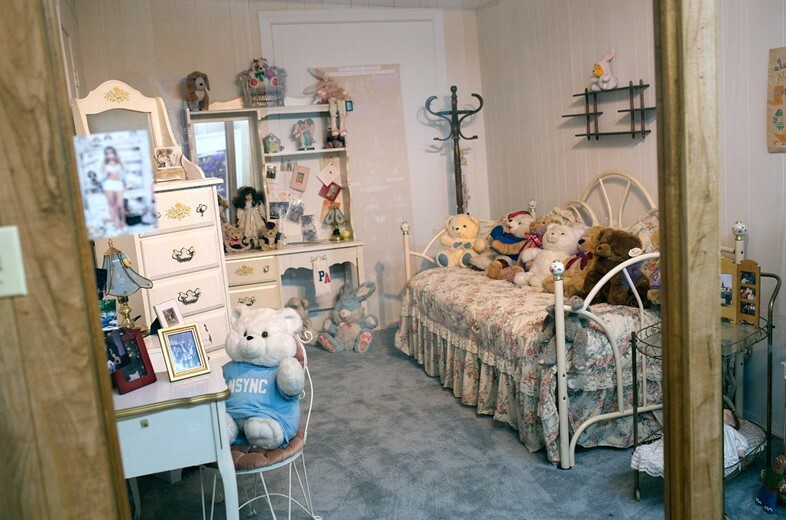 In the final room is the museum’s marquee attraction: Britney’s exact childhood bedroom where she was famously photographed by Rolling Stone in 1999. Gehringer confirms that all the furniture in the room is the real deal, donated by her parents. It’s obvious while talking to Gehringer that she isn’t a superfan. She first took the job because she needed something to do after a tragedy led her to close her family flower shop. But her favourite part is meeting fans from all over the world. Gehringer says visitors come from all over the U.S, but the most excited ones are from Europe and Australia. One memorable European showed her a picture of a pink shrine he had at home entirely devoted to Britney paraphernalia. “I honestly didn’t know there were that many things that you could have in there,” she says. To be honest, I went to the unofficial museum looking to simply see something weird – a strange shrine to an iconic pop star. But I left feeling stupid for thinking that. Britney seemed so unreachable at the height of her celebrity, but here in this little museum she becomes something else entirely, a regular girl from a sleepy highway town who wanted to make it big and made it big, with a sleepy highway town that’s proud of her. On the way out, Gehringer gives every visitor their pick – a free poster or a pin from a recent Vegas show that’s no longer marketable. I grabbed a free poster and went back to my RV, humming “Hit Me Baby One More Time”.